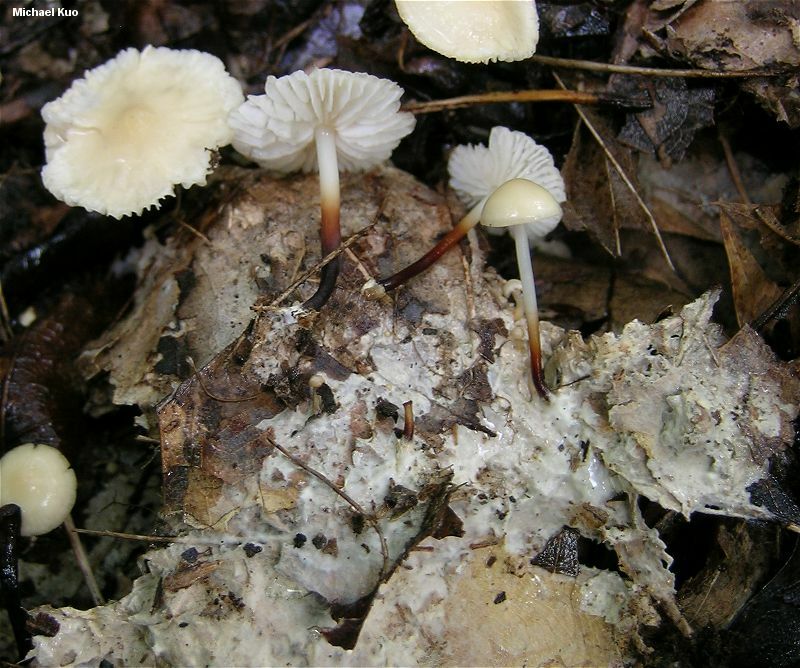 The stark contrast between the pale cap and the dark stem, together with the tiny size, the white spore print, and the habitat in hardwood leaf and twig litter east of the Rocky Mountains, will narrow down the identification possibilities for this mushroom. 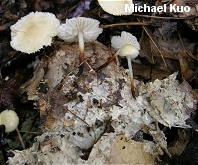 Its mycelium is a voracious decomposer, and can usually be found in copious amounts, spreading through the substrate. 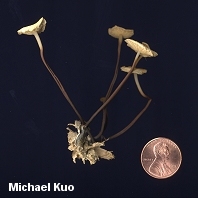 But Marasmius delectans saves some of its most distinguishing features for those who have microscopes. Like Marasmius cohaerens, it has dramatic cystidia and "broom cells" (special cells with finger-like projections). 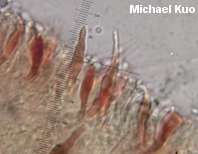 The cystidia are dextrinoid, becoming dark reddish brown in Melzer's reagent, which leads some mycologists to refer to them as "setae" (other mycologists reserve this term for similar structures in polypores). Ecology: Saprobic on leaf litter and woody debris in hardwood forests (especially oak woods); growing gregariously or in clusters; summer and fall; widely distributed east of the Rocky Mountains. Cap: 1-4 cm across; convex, becoming broadly convex or nearly flat; smooth at first, becoming somewhat wrinkled; the margin sometimes lined; pale to dirty yellowish when young, but soon buff or whitish, often with a slightly darker center. 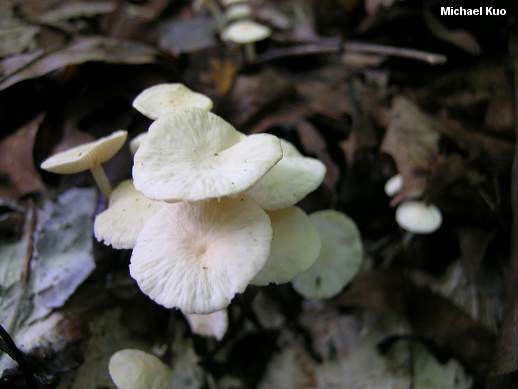 Gills: Attached to the stem or nearly free from it at maturity; distant, nearly distant, or close; pale yellowish. 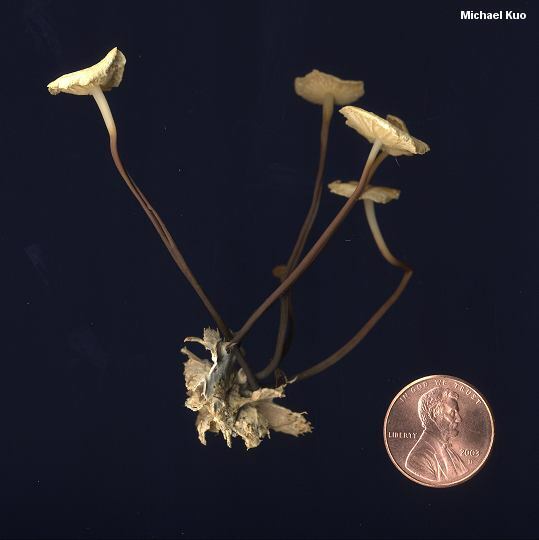 Stem: 1-8 cm long; up to 2 mm thick; equal or tapered from apex to base; dry; hollow; yellowish to whitish or reddish at first, but soon darkening from the base up to dark brown or nearly black; fairly smooth overall; with whitish basal mycelium. Odor and Taste: Taste not distinctive; odor not distinctive or, often, strong and foul. Microscopic Features: Spores 5.5-9 x 3-5 µ; smooth; elliptical; inamyloid. 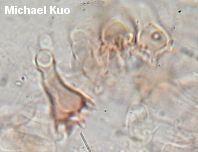 Cystidia ("setae") abundant on gills, variously shaped but often fusiform; 15-70 µ long; dextrinoid. Pileipellis with dextrinoid broom cells. REFERENCES: Morgan, 1905. (Kauffman, 1918; Gilliam, 1976; Smith, Smith & Weber, 1979; Phillips, 1991/2005; Barron, 1999; Kuo & Methven, 2010.) Herb. Kuo 07230404, 08310502.